Near simultaneously with the explosive expansion in the understanding of CK2’s prodigious promiscuity, the kinase was and has been implicated in a large number of cancers through a variety of mechanisms. Over the past few years, tremendous progress has been made in describing the diverse ways in which CK2 signaling promotes tumorigenesis, tumor maintenance, and progression. 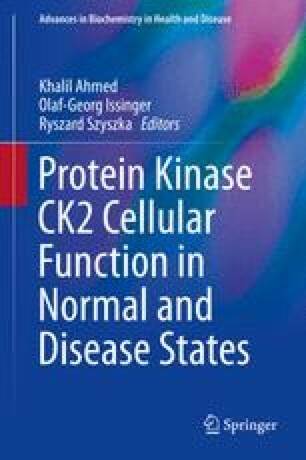 In this chapter, we address CK2’s role in cancer generally and then provide a detailed overview of CK2’s ability to regulate two oncogenic signaling pathways, NF-κB and JAK/STAT, in myriad contexts. This work was supported in part by NIH grant CA158534 (ENB), NS057563 (ENB), NS050665 (ENB), ABTA Basic Research Fellowship in Honor of Paul Fabbri (BCM), and the William E. Cash Jr. Memorial Fund in Neuro-Oncology Research (BCM).